Live from the Royal Adelaide Show, the third episode of Another Boring Thursday Night In Adelaide has finally found its natural home: the pig pavillion! In only the second episode to feature the Adelaide Visa Council, we already meet our first repeat offender. We also humbly apologise to Graeme Goodings, the TV newsman extraordinaire, for aspersions cast upon his tech savvy status in the last show. Plus there’s a Premier in pink at The Pier Hotel! Enjoy. PS Yes, we also drank red wine and enjoyed some Royal Show donuts on a picnic blanket among the pigs! Who would dare call that boring? Shout outs: We start the show with a few shout outs, most noticeably for Graeme Goodings, after we sullied his tech savvy status last week by accident. Not only is he on Twitter at @graemegoodings7 but he also blogs at The Good Innings. 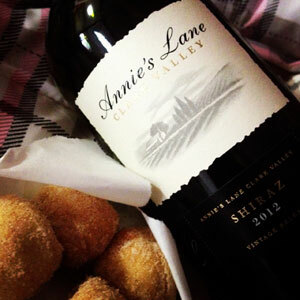 Wine tasting: Annie’s Lane (Clare Valley) 2012 Shiraz. This was a surprise wine, smuggled in to the Adelaide Show by Colin, direct from a recent cellar door visit. Colin grilled us on a blind tasting and some of us got it right (not singling Steve out at all *cough*). And Colin got to share his Que Shira’ Shira’ joke. Stories without notice: Brett takes us back through some interesting musical history relating to Eddie and Edna (mentioned in Episode One). Eddie was a jazz musician who later became a Vaudeville performer and hotelier but what fascinated us was that he grew up in Croydon where his family ran a fish and chip shop on Queen Street, and this particular shop stayed open late on Friday and Saturday nights, attracting musos from around the city who would often congregate there and jam into the wee small hours. Steve recounts his brush with Tim Minchin on behalf of his sister, Tania Davis (who gets credit this episode for being our location scout and manager at the Adelaide Show). Colin reports on Let It Be, a concert he attended at the Adelaide Festival Theatre, starring Glenn Shorrock and other Aussie music legends interpreting Beatles’ classics ‘better than the Beatles themselves’. We must get Bob Francis on the show to get his perspective, seeing he MCed the Beatles’ first concert in Adelaide. Click to read the judgements from hearing 003. Adelaide’s Yesterdays with Colin: That day in 1976 when Premier Don Dunstan stood on the balcony of The Pier Hotel in Glenelg and defied the predicted (dreamt up) tidal wave, said to have been coming to wash away the sins of the city. Brett’s Musical Pilgrimage: Brett reviews a song by David Robinson, an Adelaide-based, singer songwriter known for his storytelling in song. This week’s track is called Shining Light and is about people misusing Facebook and being drawn into a secluded world of fake profiles and stories instead of embracing the richness of face-to-face human relationships. The boys debated his argument but all agreed the song and wordplay were superb. You can hear the song at the end of our podcast. I said it in the podcast and I’ll happily say it again, that Adelaide’s own Glenn Shorrock, with John Paul Young, Doug Parkinson and Jack Jones sang Beatles songs better than the Beatles. Sure there’s a difference in technology these days (up to 50 years later) and therefore a different sound, but for my money, Glenn & Company have voices that stand tall and proud. It was totally my pleasure to be in their audience.